This gross body, I cannot be. Why? I am seeing it. It is an object for my sight. I am the seer. It is separate and I am separate. This gross body is not mine. Why? It belongs to the five great elements. It is a product of the pentamirus combination of the five elements. It cannot be mine. Why? Look. These represent the five elements. Every element is divided into two halves. One half remains unchanged. The other half is further divided into four equal parts making each equal to 1/8 [one eighth] of the original. Thus each is now found as five parts. With the unchanged half of each element, 1/8 [one eighth] part of each of the other four elements are combined, thus making a size as whole as the original element. But each now contains all the elements but one only predominates. Thus in this pentamirus combination, twenty-five factors are manifested. How? Thus in this five fold combination twenty-five factors are manifested. How? 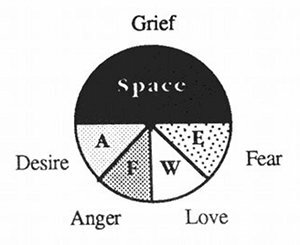 Grief, desire, anger, (love or) attachment, fear. Grief is the principal quality of space, a feeling of nothingness. Desire is produced by the combination of wind with space. Anger is produced by the combination of fire with space. Attachment or love is produced by the combination of water with space. I am not these: grief, desire, anger, attachment or fear. I am seeing them. I am the seer. They are not mine, they belong to the various elements noted as above. I should not claim these as mine.